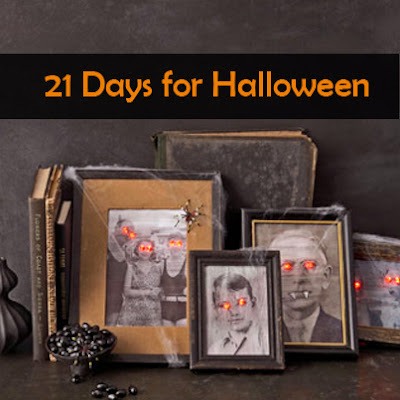 There are tons of ways to haunt your house for this Halloween.. These days we've shared with you some clever ideas from creepy trees to pumpking-carving hacks.. 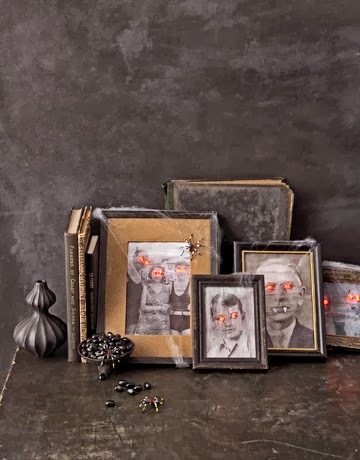 But this DIY Tutorial, from Country Living,will transform the photographs of your loved ones into a ghostly display, that you'll never look at them the same way after this. These spooky portraits are easily made with photo copied photos and string lights. *Bonus points* if you put the lights on a remote control to light up when guests are nearby. STEP 1: Make a black-and-white copy of a portrait on printer paper and cut out. STEP 2: To "age" the picture, lightly brush it with a sponge dipped in a solution of a few drops of black craft paint mixed with water. Let the paper dry. STEP 3: Cut a piece of card stock the same size as the photo, glue to the photo's back, and let dry. With an X-Acto knife, cut out the eyes of the picture's subject(s), piercing through the card stock and creating holes about 1/4 inch in diameter. STEP 4: Open the frame's back, remove the glass, then fit the photo inside. STEP 5: Insert red mini LED Christmas lights through the back of the eyeholes. Plug in the lights, then replace the frame's backing — securing it with tape if necessary — and drape with fake cobwebs. Steal this idea! Add a little extra bite to your photos with fangs: Cut small triangles from white paper and glue or tape them to the subject's mouth.